I have never tried shooting fish in a barrel. Is it hard? Or is it easy? 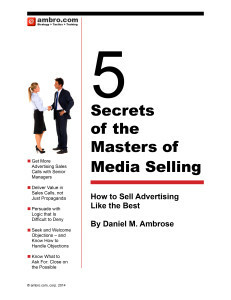 Some advertising sales managers would say that selling ads at tradeshows is like shooting fish in a barrel. Maybe the analogy is best taken to mean you can see the prospects, but you can’t hit them. So often when you stroll a trade show you can see the product or marketing managers you want to speak to, but they are busy with their own customers. Attending and utilizing trade shows for sales is a key skill for almost every kind of advertising sales person. If you sell national trade advertising, the trade shows in your industry are a key source of content and of leads, as well as a place to meet your prospects. If you sell local TV or radio or newspaper advertising attending the local “home-show” will be a source of leads and a great place to chat up potential customers. 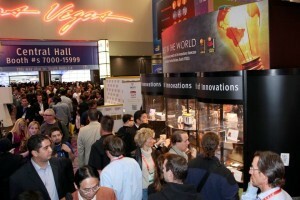 The Consumer Electronics Show is not only the biggest trade-show on earth, but the largest room full of advertising prospects. Trade shows have long been a key prospecting and selling environment for advertising sales executives. It is also notorious for having a thousand ad-sales executives marching around trying to button-hole every product manager. Some shows are especially crowded with ad-sales reps. Others, if you are enterprising, you’ll have to yourself. First, they are often the best place to learn about new products before they become common knowledge. The launch of new products is often the reason behind an increase in advertising, so you need to know who’s doing what, when, in order to be most effective. Second, senior executives who are not a part of ordinary advertising buying processes attend trade shows. Despite the fact they’ll say they delegate ad buying to others, their opinion influences the buyers. Senior executives attending trade shows are also likely to be out of their home town, leaving them more likely to assent to a lunch or dinner than when they are in their usual setting or routine. Connecting with them at trade shows can be effective. Perhaps you can even schedule a dinner with a key client and their boss while both are at a show. Third, and finally, trade shows are a great place to gather information to use in the sales process. You can interview competitors or distributors or retail sales people who can attest to how your prospect’s brand fits into the market — and why they need to advertise. Prepare a list in advance of the accounts who’ll be exhibiting at the show you are attending, with the names of they key personnel you’d want to meet there. Prepare a custom hand-out for each account on the list; a copy of your magazine with specific pages marked, or a brochure about your property with the name of your target contact written on your business card clipped to the brochure. Visit every account’s booth at the beginning of the show and leave the brochure or magazine, even if your contact isn’t there. It is highly likely it will be passed on to them. Make a list of at least three things you’d want to research at the show by asking questions of sales people or by surveying show attendees. Commit yourself to accomplishing at least one of those things, depending on the time that becomes available.